A commercial masonry business for over 20 years. CF Masonry Specialists has earned the trust of the most respected contractors in the Baltimore, Maryland and Washington, D.C. region. A fully-bondable commercial masonry contractor, we have the capability to complete projects of every size, in every sector. Our exceptional craftsmanship is the cornerstone of the value we bring to our clients. We support our masonry work with a full scope of services to cover every aspect of the project lifecycle, including estimating, project management, and inspection. When you work with us, you’re not just hiring a contractor, you’re partnering with experienced masonry professionals that are committed to the success of your project. Our staff undergo extensive training and our in-house safety director implements procedures to ensure we exceed industry safety standards. An extremely condensed work schedule as a result of fast-tracked construction, along with challenging site conditions didn’t keep us from meeting our goals. 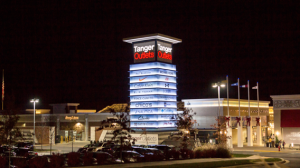 In the space of six months, we completed the project to complete a multi-million dollar finished product, allowing the shopping center to open in time for the Black Friday sales.